Claims to support up to 400lbs. I am also looking into buying a pull up bar. My door’s width is 35.5 inches and the trim is 3.3 inches wide. I weight around 200 pounds, which pull up bar would be suitable for me ? Why don’t you just get creative and make one for cheap? I am going to make one here as soon as I get some free time but for a weird piece of wall in my place where 2 doors are perpendicular. I am going to cut a piece of pipe to fit dirrectly over the strongest part of the frame and then tap it in secure with nails pointed in a V pattern. Hopefully it will be awesome. Anything you can grip securely and will hold you securely works. Doesn’t matter how pricey or fancy. I got mine at Champs sports about 8 or 9 years ago. It works great. A few friends bought the same one after using mine. But it does require that you bolt in a piece behind the door - see the video. But still looks like a good bar and would be nice and secure. This is the bar I just put up today. Cost me a total of $11.00 at Lowes. 3/4" galvanized pipe and a box of 8d nails. This is how I secured it. It feels pretty sturdy however I wont be swinging on it either. I would pay money to watch this happen. agree with the powerbar, it’s awesome! Stud Bar - ceiling or wall mountable pull up bar. 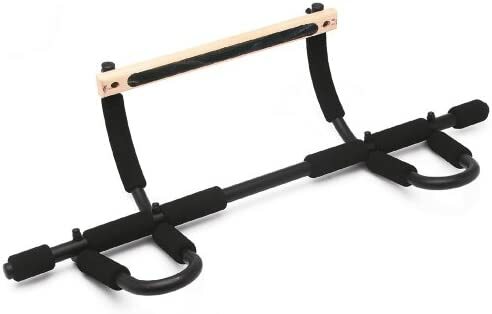 Fixed-mount pull-up bar for CrossFit, chin ups or kipping. Install in your ceiling, rafters or wall studs. I am planning on incorporating Gymnastic Ring exercises. I have the Stud Bar. It’s wide and stable, but probably overkill if you’re not pulling some serious weight. I like it and would recommend it if you need a quality bar. I don’t know what kind of exercises you have in mind, but buying a pair of gymnastic rings would be cheaper. Alright, studbar is out of my list. got one and i love it! That’s just awesome. I’m not saying you should get it, because it might be more than you need, but it’s awesome. I contacted the company and asked for the shipping price to UAE. another recomendation here for the powerbar.very good.